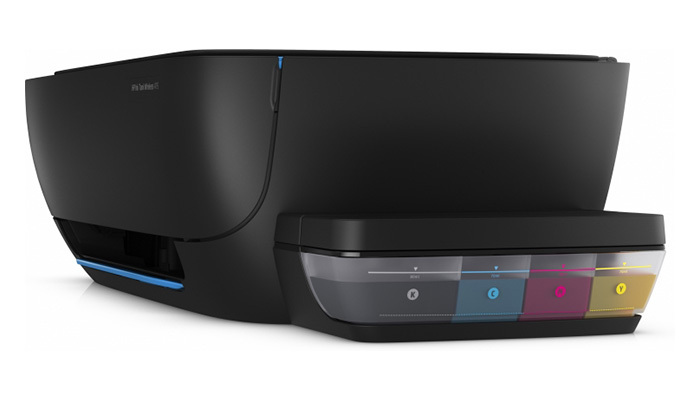 The HP Inc. rolles out a new family of multifunctional printers — HP Ink Tank — designed for home and SOHO users. The new devices is superiour to the previous model line, DeskJet GT, in a number of aspects. In particular, HP Ink Tank has a special automatic valve, that makes it possible to transport printer without the risk of damaging printheads. The devices have an extended warranty of 2 years or 20,000 pages and can print 5,000 to 15,000 monochrome pages with the stock cartridge. Speaking of the cartridges. They can be refilled and to facilitate the process, HP has come up this such a design for the ink tank, that totally prevents over-refilling. Yet, the tanks are transalusent, so you can easily tell how much ink is remaining. HP Ink Tank 415 and 419 models support wireless connection, adn you can manage them from your smartphone or tablet using HP Smart App. This application enables you to print photos from social networks, your cloud or gallery, scan images and share them with your friends and collegues. HP Ink Tank 315 and 415 MFP come in black color, and HP Ink Tank 319 and 419 are available in back and blue. This entry was posted on Tuesday, April 10th, 2018 at 9:22 am	and is filed under HP, inkjet, multifunction. "First Double-Sided A3+ Printer From Epson"
"Canon IVY, A Compact Wireless Photo Printer"